I suppose my lesson should be moving in is hard work! I've been taking stuff over to my new flat and unloading each day after work. But it does feel good to be there! Unfortunately, I still don't have a bed or a fridge and I can't get water to come out of the taps. I rode up and down in the lift for a bit and met some other people in the building and a nice Irish chap tried to get it going but still nothing. So I'm now awaiting assistance from maintenance. I used to hand cut all my own letters because I though alphabets were too expensive (and they were on a student budget!). I firmly believed all photos should be matted and that you should cut the back out of the matting to save paper because it's expensive. All photos must be printed at 6x4 as a job lot of 200 because that's the cheapest way and printers are too expensive. And try not to use more than one sheet of patterned paper: that's really expensive and you may never be able to buy it again! In fact, this page really pushed the boundaries for me at the time because I outlined things by hand!!!! This is highly dangerous because if you make a mistake you could ruin the paper which is expensive. P.S. I WANT THE TAPS TO WORK!!!!!! Sometimes I need to stop dashing about and breathe. This month has been manic and I crashed out and slept for 10 hours last night so I think this is particularly timely lesson for me. Over the last couple of days I've had school, Guides, a meeting with my Masters supervisor, been furniture shopping (disaster), arranged for a delivery of small furniture items and worked out and test-driven the route from my soon-to-be flat to work. Oh, and laundry and started packing. But there's been fun stuff too! I had lunch with one friend and dinner with another yesterday. The latter showed me how to use a Wii which I'd never done before so that was fun, but I didn't get home until after midnight which is late for me. I'm a solid bed-at-half-ten type. I made a page today although I couldn't fit one in yesterday. Might try and do that tonight. While there's still lots of stuff that has yet to fall into place, I can see a pattern emerging for the move however which is reassuring as I no longer feel like I'm surrounded by chaos. I'm so grateful to those lovely folks who've volunteered to pitch in. Anyway, I'm going to do an hour's packing and then call it a day and forget about everything. And order some take-out. Yum! New motto being that even if you can't clear some free time, at least you can make a cup of tea and get someone to deliver delicious things to your door! Hope everyone had lovely weekends! P.S. I had another sheet of the Basic Grey Basics after all! But that truly is my last. P.P.S. I'm going on a scrappy retreat in half term with Scrapagogo (I'm not a subscriber by I snagged a place due to a last minute cancellation) and I just got a glimpse of the class list which has made me super excited and given me something to look forward to! P.P.P.S. I really don't understand the UKScrappers website. No page today because I started school at half past seven this morning and I have just clocked off, leaving at about quarter past nine this evening. It was a good day though. We dismissed the students after lunch in order to prepare the school for the evening. This meant that I had a half hour tutor time with my form and nothing particularly to do. When asked what they'd like, they said they wanted me to read them a story. So I did. They all sat on the floor and I read their choice of literature which they brought into school specially. We didn't have time for the pop-up book but I did read them '10 Little Ladybirds' which rhymed and had counting which we practised on our fingers and lovely pictures. We also read Sammy the Snail which has interactive eyes that I could put my fingers in and move about to peer at my audience. They really enjoyed it. They cheered and said "Ahhhh" in all the right places, and I did all the voices and patronised them as much as I possibly could. I love being form tutor to this bizarre collection of 15-year-olds. This evening was our prospective parents evening, when the school throws upon its newly polished doors to entice parents into sending their students here. The sixth form made rather good tour guides having been prepped with tons of information and drilled on parroting it on command. Younger students helped out in departments across the school from the music groups which performed at various venues throughout school on a rolling schedule to blowing things up in the science department. I was based in maths but did the odd bit of violining in the gaps with Camerata, the senior string group. My favourite moment of the evening was when we were all sat in one of the music rooms. The music teacher had popped out of the room and a group of parents turned into the corridor. The student who was leadin raised his violin, looked meaningfully at us all and gave us a nod and we all came in together, the parents arriving at the music room to meet a burst of sound. Fantastic! So it's been busy and hard work (our head of department had me on hands and knees cleaning the radiator!) but a great day which really showed off what the school can do. I'm really proud to teach there. So, as I said, no page. But that's OK. I'm not going to catch up as I'm not making a mini-book, just a series of 12x12 pages about my September so it's not going to matter if a page is missing. And I've already managed more in a row than I thought I would. But I did want to record my day here because it was good. P.S. My lesson for today is that the most marking always crops up at the worst time. Today I marked 30 exam papers and 28 exercise books in and amongst. Page about this tomorrow. Yesterday, I learned that a simple things are loads of fun when you do them with family. This is a page about my family playing Boule. We all mocked Dad a little bit when he said he thought it would be fun if he dug it out of the garage for my brother's birthday. But the whole family played and got really involved and we all had a wonderful time. Brilliant! In other news, it's beginning to dawn on me how much effort it's going to take to move. I spent 20 minutes arguing with Argos yesterday trying to get them to deliver a bed to me on a particular day. The wouldn't. Still can't wait though! P.S. No word from the press. Thanks for the suggestions - I will totally try emailing them! Well, this is my rather patriotic looking page! A friend and I queued for tickets to the Last Night of the Proms yesterday. The rain held off which was good as we had to sit in line from about ten in the morning until seven in the evening when they let us in. We were 130 and 131 in the queue so we thought had a pretty good chance of getting tickets. Awesome day: the time flies by, we ate tons of houmous having both brought the same things for a picnic (more forward planning needed there, but who doesn't love houmous?) and waved our flags. Loads. Oh, and we sang, too. A chap from the Telegraph took our photographs as well but I haven't seen them in use. I gave him my email and made him promise to send me a copy but you never can tell with the press! And what did I learn? I learned the proper way up to hang a Union Flag. If you hang it upside down, you are indicating that you are in distress. Although how anyone can tell from a distance I don't know. I hope everyone's having a lovely weekend - I am! P.S. I REALLY want a copy of the pictures he took - they were amazing, what with him being a professional and all. I should have explained to him about my scrapbook. It's now less than two weeks until I move. With this in mind along with the fact that I haven't heard from my solicitor for a while, I got in touch and her response was along the lines of "Chill, it's all good, man". Clearly my solicitor is considerably more chilled than I. So today I was sent all the completion documents and information including a statement of everything that I owed. It worked out to about six grand more than I was expecting. I nearly had a heart attack. For about thirty seconds I panicked about where on earth I was going to find six thousand pounds. Then I got another email from the solicitor: They had sent me someone else's stuff by mistake. Fortunately, my real bill was a little under my budget. Relief. My solicitor, chilled as she is, was all "Ooops, butterfingers!" My lesson is really that although this move is going to cost a lot, more than I knew when I naively decided I wanted to get on the property ladder, is that having my own little slice of home is priceless. And yes, I shamelessly plagiarised the Mastercard adverts in my journalling. P.S. Obviously I have paraphrased the solicitor, but not as much as you might think. Once of my lessons for yesterday was that a little help goes a long way. However, I didn't have any pictures for that so the lesson I scrapped was that sometimes the simplest ideas are the best ones. Or perhaps that necessity is the mother of invention? I made about sixty of these cupcakes for a friend's birthday party: chocolate with pink, cinnamon and cream cheese icing and topped with a malteser and some edible glitter because, darling, it's the thing. Slightly 70s disco-ball-esque, but cute. Ready to go, present and cupcakes in tow, I realised I hadn't got a card. So I stuck one of the full size cupcakes in a box, labelled it "Eat Me" and addressed it to her. And I'm so keeping this idea for the future. Christmas, bring it on! P.S. I'm going to Guides tomorrow! I'd like to train to be a leader so I'm pretty excited, especially as I loved Rainbows, Brownies and Guides so much when I was younger. This is my page for yesterday: Bad Day at the Office. Glad that one's over even though it did turn out alright in the end! I arrived at school this morning to find the school cat in the maths office. The school cat is not the brightest of creatures and seems to possess no distinguishing character traits of the common or garden cat. For example, it followed me out of the office, down the corridor, round the corner and outside as I beckoned and spouted forth the most dreadful baby talk. Cats are supposed to look at you in disgust and walk the other way. Anyway, I shut the door in its face. Ten minutes later, I found it sitting on the teachers desk in one of the maths classroom. I repeated my trick. It's an incredibly daft, soft sort of animal, but it more than tolerates the boys who treat it with a great deal of affection. Unless it accidently gets in the way of a goal. And one of my lessons for the day was: A little help goes a long way. Today it was wall display day: Part one. Part one involves ripping down the old wall display and putting up backing paper. The actual display comes next week. However, unless you have good backing, the display is going nowhere. I enlisted (read: bribed) my form to help me. So at lunch time, a surprising dozen boys showed up to help. Clearly the bribe offered was too large. I explained that they needed to tear everything off the wall while I went to fetch the staple gun (NO YOU MAY NOT USE IT)and the new backing paper. I was gone for perhaps 30 seconds while unearthly shrieks echoed down the hallway. When I went into the classroom, they were standing around in shreds of paper with enormous grins on their faces and the wall was absolutely stripped bare. I've never seen anything like it, except perhaps when Mr Attenborough shows us all what a piranha attack looks like. They less enthusiastic about putting the backing paper up (DON'T TOUCH THE STAPLE GUN). Their assistance consisted mainly of eating their sandwiches and pointing out slight blemishes. Still, it's all done, and I am really enjoying having a form. It's extra work but I think I've mainly worked out how and when to fit it in. They are a crazy, noisy, over-excited handful. But an extremely entertaining one! P.S. I am TOTALLY going to the Last Night of the Proms. Will be setting off nice and early on Saturday morning to go and queue for my ticket. Bring it on! Here's my page for yesterday - ginger cookies go down well in the maths office! Today, my lesson is a little more practical: sometimes everything goes wrong. I've had one of those days. A spider had built a web in my shoe, my car had some sort of episode (I think I'm going to give it counselling), I accidently taught the wrong thing to 2 classes in one day (I've never done that at all before), I forgot to go to symphony orchestra and I'm doing what feels like continuous battle with 6th form students who want higher grade predictions that I've given them. And their parents. I felt quite drained by the end of the day. Now I love my job, but I really could have done without today. Fortunately my colleagues were sympathetic and when I arrived home, my Mum had written to me and stuck little punched out butterflies all over a sheet of writing paper and an envelope to brighten it up a bit which made me smile. And thanks to that I feel much better! Plus I knew that I was going to come home to a some scrapping (see above!) and a couple of cookies that I saved back for myself and a snuggle up in bed with a good book. P.S. So I suppose another lesson is that even something as small as someone sending you a punched out butterfly can really make a difference to somebody's day. Here's my page from yesterday, the lesson being that I really miss my family sometimes. It feels like I'm a long way from home. However, I am also lucky to have a family that I'm close to in order to miss them. Quite a melancholy page for me, I don't normally scrap topics like this. Something else I've learned! So today's lesson is a little more whimsical. To whit: you can buy the affection of anyone with a spot of home baking. I made some ginger biscuits from my grandma's recipe this weekend and put a box aside to take in to my colleagues in the maths (as well as getting me in the good books!) I quite often use cupcake recipes from Shimelle's blog actually. P.S. It's a little bit gloomy this evening hence poor picture quality. Sad face! I thought I'd have time get home from work, do the page and photograph it before it was too gloomy outside but this plan was scuppered when I thought to myself, "Yeah, hand stitching round the circle won't take that long". Yet another lesson, perhaps? I just want to say thank you all so much for the comments you have left for me - it's so nice to get feedback from other people and I find it really inspiring! 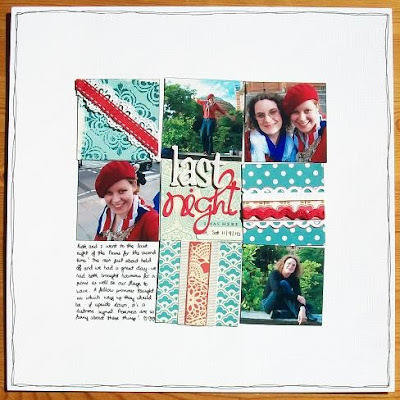 I am definitely finding it a challenge to do a 12x12 each day and I have no idea if I'll be able to keep it up, but I put together lots of bits and pieces before hand which is a big help. Also, I love to see that so many scrappers are teachers! I think the two go really well together as both scrappers and teachers are creative and love joining in with life - and documenting it! My page for yesterday is above - I had so many lessons to choose from and I cheated a little bit because I really wanted to scrap these photos. They're actually from the Maize Maze on bank holiday Monday. The lesson was that it's important to have friends that are as silly as you are. I love that my friends are willing to be daft and leave their dignity behind - we have much more fun that way, screeching around in the maze! So I'll save the stuff about days in for next time I think! (And I'll try and remember to take some photos). My lesson for today is about my family. I moved to London from Yorkshire a year ago and I do love London and all it has to offer. But I really miss my family as we are very close and get on really well together. I call home a few times a week and chat with my Mum (and we email quite a lot - she's a scrapper too!) but I do wish it was a bit easier to visit. I probably won't be able to go home until Christmas now which I love to do and I will spend the whole holiday there, but that seems like a long time away right now. I don't mean to sound maudlin - I love living here, there's so much to see and do and I have wonderful friends who totally occupy my time! But if I could change one thing about London, I would put it nearer to Yorkshire. P.S. I am totally getting muddled about which prompt is for which day, which lesson is from which day and which day is the page I've just scrapped for. Duh! P.P.S. Got my friend hooked on Sherlock last night. We have now got 2 more DVD nights in the pipeline! First of all, this is my page for the 1st and I went with driving my car in the end. What have I learned today? Always give specific instructions. Very specific. Like sending ditzy form members to go and pick up the planners doesn't work unless you tell them to bring 30. Telling them to get enough for the form means they don't bother to count, make an estimate and end up only bringing 25. Fail. Ditzy they might be, noisy they certainly are, but they are also a very good-natured form and I'm really excited about being a form tutor for the first time. Even if it does mean dealing with the growing pains of 30 15-year-old boys. Yikes! P.S. After the bell for the end of school today one of the new Year 7s wandered into the office looking for his form tutor. He wanted to know if everyone was allowed to go home now. Bless their little cotton socks! P.P.S. Yes, I'm a maths teacher. What else would I teach?! For Shimelle's class LSNED I'm going to do a 12x12 page each day (in theory) and use this blog to keep a diary of my experiences at school. I can then use this diary to provide the journalling for the pages. Easy Peasy! Right? Although I had forgotten both tea and milk, the day turned out rather well. Just getting back in the building and seeing all my fellow teachers perked me up. It even smelled good. Schools do have a particular smell (some departments more than others) but maths smells sort of academic and like old textbooks. Perhaps because the department is full of old textbooks. I snuck into my classroom and seeing it all clean and fresh filled me with ambition and inspiration for the year ahead. Bring it on. Unrelated (as there was no scrapping today) I made a page about my visit to the horse rest home during the bank holiday. P.S. Poirot time! I desperately want to visit Syria! And also Jordan and Egypt. Finger crossed for next summer.